Description: Reminiscent of the American Mission revival movement, this ceiling fixture features welcoming light evoked through stunning Beige art glass with a clean straight line design. 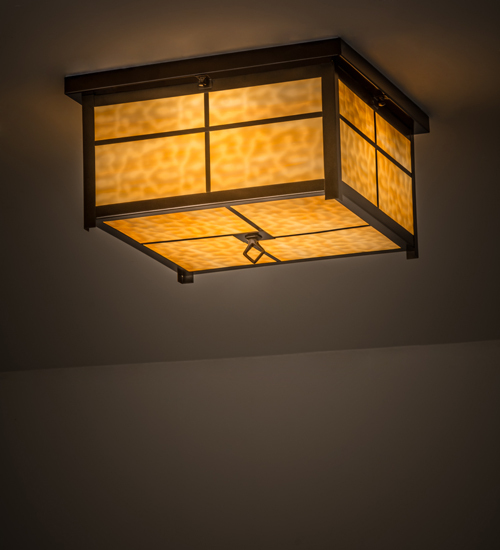 This luminaire is enhanced with decorative accents, frame and hardware featured in an Antique Copper finish, including a diamond shaped finial. This fixture is handcrafted by Meyda artisans in the USA at the foothills of New York's Adirondack Mountains. Custom colors, sizes and styles are available, as well as dimmable energy efficient options such as LED. The fixture is UL and cUL listed for dry and damp locations.